Following our fantastic collage entry win, Stefan Gates and his team came into our school to deliver a fantastic 'Gastronaut live' show. This incorporated science and food. It was amazing and children were blown away with the experiments and investigations. Photographs and further details of this event will follow very soon which will be published in our school newspaper online. Left to right: Miss Kirsty Knutsen, Duschaint Dherani Headteacher Mrs Ruth Town, Stefan Gates, Orlaith McAlinden, Megan Danily, Harry Mawer. 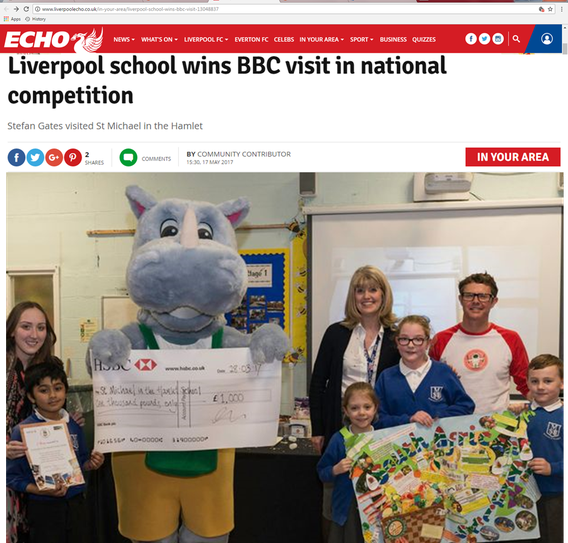 Liverpool primary school, St Michael in the Hamlet, received a high energy, interactive food and science spectacle from BBC’s Stefan Gates, after winning a nationwide competition to learn about South African food and culture. The school’s collage on the theme of ‘A Taste of South Africa’ won first prize, along with £1,000 for school resources. Kirsty Knutsen, Year 2 teacher at St Michael in the Hamlet, said: “We were so excited that we won the 2016 Help a South African School competition. “Putting the collage together was such a fun and novel way to teach St Michael’s children about the fascinating history, culture and geography of South Africa, as well as the importance of Fairtrade. Primary schools across the UK submitted collages based on the theme. The aim of the competition is to increase awareness and provide support for South African fruit farming. Alongside the competition is the opportunity to donate unwanted books, which are being collected from schools free of charge by courier company MyHermes and shipped to South Africa by Maersk/Damco. Illiteracy is a big problem in South Africa and their schools are in desperate need of resources; particularly reading and text books for under 13-year-olds. The Help a South African School 2017 competition has now started accepting entries and will close on May 26.